Introduction. 2. Evaluation of Deposit Geological Conditions for Design Requirements. 3. General Principles of Mine Design. 4. Design of Mine Reconstruction. 5. Design of New Mines. 6. Planning the Development of Coal Mining Regions. 7. Planning and Design of Hard-Coal Preparation Plants. 8. Energy Management in Mine Design. 9. Mine Storage and Transport Management - Transmag'' System. 10. Economic Problems in Mining Investment. Bibliography. Subject Index. The escalating worldwide demand for energy has had the effect, among other things, of promoting the development of coal mining. In some countries specialist design offices were set up and students trained as specialists in mine design and construction. Poland, a country having mining traditions stretching over many centuries, is a good example, and has gained a place in the forefront, not only as a coal producer and exporter, but also as an originator and exporter of technical mining know-how. 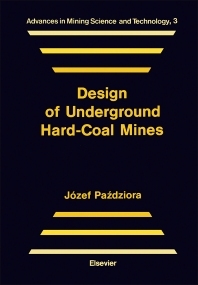 The author of this book has himself had 25 years of practical experience in mine design, in the supervision of mining investment implementation both at home and abroad, and also in directing the activities of the Chief Mine Design and Studies Office in Poland, plus more than 20 years' teaching experience in the training of mining engineers, in particular as head of the Mine Design Department of the Mining Faculty at the Silesian Polytechnic University in Gliwice. This vast wealth of experience has prompted him to write the present book which discusses the basic problems met with in the design of underground hard-coal mines. The author's primary aim has been to deal with all those questions in mine design which have not yet been answered in mining textbooks and which, from his own personal experience, he considers to be of importance. Accordingly, he presents the general principles governing the design of new mines and the reconstruction of working mines, the development of mining regions, the design of coal-preparation plant, and energy economy in mines. Making use of the broad experience gained by the Polish mining industry in the implementation of mining investment projects, he has quoted several examples of technical and organizational solutions which effectively shorten the mine construction cycle. The book is addressed chiefly to investors and engineers engaged in preparing plans for the development of mining regions, for the construction of new mines, and the reconstruction of existing mines and preparation plants, as well as to students in mining departments of technical schools and universities. The information offered here is of great practical value and may well stimulate the development of new ideas for design and implementation concepts.